Octagon announced today that 17-year-old Caty McNally has signed with the sports management agency, based in McLean Virginia. Octagon had been tracking McNally for the past couple of years, and agents from company were often seen at her Wimbledon and US Open matches. The McNallys were not in a rush to sign, and were still considering college as an option (the route her brother John, a sophomore at Ohio State took) until she began to post impressive results at higher level ITF Pro Circuit events and beat Top 100 WTA players. 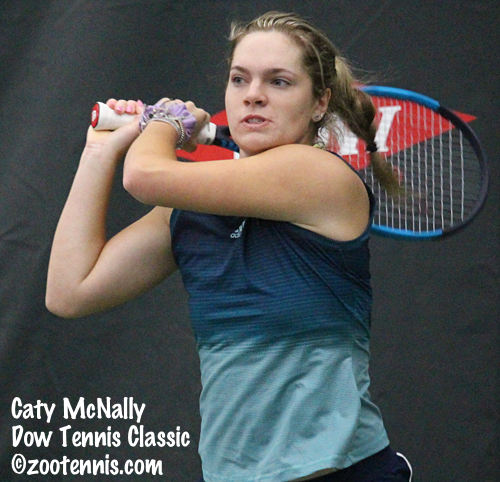 After McNally won the Midland Dow Tennis Classic $100K without dropping a set in February, with a wild card that Octagon helped her obtain, turning pro seemed much more likely than retaining her amateur status for another year and attending college. McNally's current WTA ranking is a career-high 214. Former University of Texas men's tennis coach Michael Center agreed to plead guilty today in the Operation Varsity Blues college admissions scandal that has been in the news for several weeks. When initially charged, Center's then lawyer had said he would plead not guilty, but that obviously changed and he will plead guilty to one count of conspiracy to commit mail fraud and honest services mail fraud, according to this article in the Austin American-Statesman. The student involved in obtaining admission as an athlete, when he lacked the qualifications to be on the tennis team, has now been identified. His father, who made donations to advisor Richard Singer's foundation, has not been charged. Because I was so busy at the ITF Grade 1 International Spring Championships in Carson last week, I didn't have time to follow the two women's ITF World Tennis Tour events in the US, a $25,000 tournament in Mississippi and an $80,000 event in Florida. Neither tournament produced an American singles champion, with top seed Nicole Gibbs(Stanford) falling to No. 5 seed Barbora Krejcikova of the Czech Republic 6-0, 6-1 in the final and No. 2 seed Ann Li losing to top seed Katarzyna Kawa of Poland 6-3, 6-2 in the final. No. 4 seeds Quinn Gleason(Notre Dame) and Ingrid Neel(Florida) won their first title as a team in Florida, beating the unseeded team of Akgul Amanmuradova of Uzbekistan and Lizette Cabrera of Australia 5-7, 7-5, 10-8. At the Volvo Car Open in Charleston South Carolina, Madison Keys won her fourth WTA title and her first on clay, beating Caroline Wozniacki of Denmark 7-6(5), 6-3 in Sunday's final. For more on Keys first title since 2017, see the WTA website. American doubles teams picked up two titles in Mexico last weekend. Maria Sanchez(USC) and Asia Muhammad one the WTA International in Monterrey, with the No. 3 seeds beating the unseeded Australian team of Monique Adamczak and Jessica Moore 7-6(2), 6-4 in the final. It's the third WTA doubles title for Sanchez and the fourth for Muhammad, and their second as a team. An ATP 125 Challenger was also in Monterrey last week, with unseeded Evan King(Michigan) and Nathan Pasha(Georgia) taking that doubles title with a 7-5, 6-2 win over top seeds Santiago Gonzalez of Mexico and Aisam-Ul-Haq Qureshi of Pakistan. It's their first Challenger title as a team, with King now a three-time Monterrey Challenger winner (2016, 2017, 2019). Former USC star Emilio Gomez of Ecuador, who was unseeded, reached the singles final before falling to No. 7 seed Alexander Bublik of Kazakhstan 6-3, 6-2. "The student involved in obtaining admission as an athlete, when he lacked the qualifications to be on the tennis team, has now been identified. His father, who made donations to advisor Richard Singer's foundation, has not been charged.'? Recruits in that yr and from California......duh....and the coach is charged and not the parents? Bone up..charge everyone involved...or don't charge anyone! allegedly...." from the austin paper...The student whom Center helped get into UT is the son of Silicon Valley venture capitalist Christopher Schaepe, who last month told the American-Statesman through a spokeswoman that he believed three donations he made to Singer’s Key Worldwide Foundation — a total of $631,564 — were aboveboard. Schaepe, who has not been charged in the case, said he was stunned to learn about the allegations against Singer. He was ousted from the venture capital firm he founded last month after he informed his partners that Singer had helped his son get into UT. Prosecutors say Schaepe’s son signed a small scholarship with Center’s team, enough to cover the cost of books, before rescinding it shortly after arriving on campus in 2015. Schaepe’s spokeswoman said the student thought he was signing up to be a manager for the team, not to play. The student pivoted to a manager position for Shaka Smart’s men’s basketball team. We in the tennis family hope all things work out for everyone involved. I do not think Caty has the weapons to get much past 120 or so in the rankings. Older players have all the pressure when playing teens and historically many girls have 1 or 2 great tournaments before returning to their tennis reality. Don't think this will be much of a money maker for Octagon. Recruits in that yr and from California......duh"
That player on tennisrecruiting is NOT the person involved in the scandal.